Our Gospel today centers upon the primacy of St. Peter's role in the early Church and how our Lord designated him as first among the Apostles. In a way, Peter's character traits are those with which we can easily identify - he's a complex person, at times zealous for the Lord and other times so fearful of what being a disciple will cost him that he even denies knowing Jesus. He's a simple man, a hardworking fisherman, with probably no formal education to really speak of and yet tasked with the greatest of responsibilities - that of being the first Pope. Peter loves his Lord and Master and yet he can't even recognize the Lord as He stands on the side of the Sea of Tiberias. Note in our Gospel that it is actually John who informs Peter that it is in fact Jesus who is standing on the beach, giving them instructions to make another cast for fish. It's only after John tells Peter that it is the Lord that Peter jumps into the water to swim toward Jesus. It is striking that today's Gospel passage is very similar to the first encounter that Jesus and Peter have earlier in the Gospels. In the first meeting, Jesus calls Peter to be an Apostle and Peter asks the Lord to depart from him for Peter acknowledges his unworthiness. In this meeting, Jesus will now call Peter to be Pope and restores His confidence in Peter and his vocation to lead the Church. When the other Apostles drag the catch of fish ashore, the Gospel tells us that they had caught 153 large fish. Scientists tell us that there were about 153 species of fish in the Sea of Tiberias in antiquity, indicating that this number means that Peter's ministry would be universal, what the word, "catholic" means. This passage is then so very rich with symbolism. 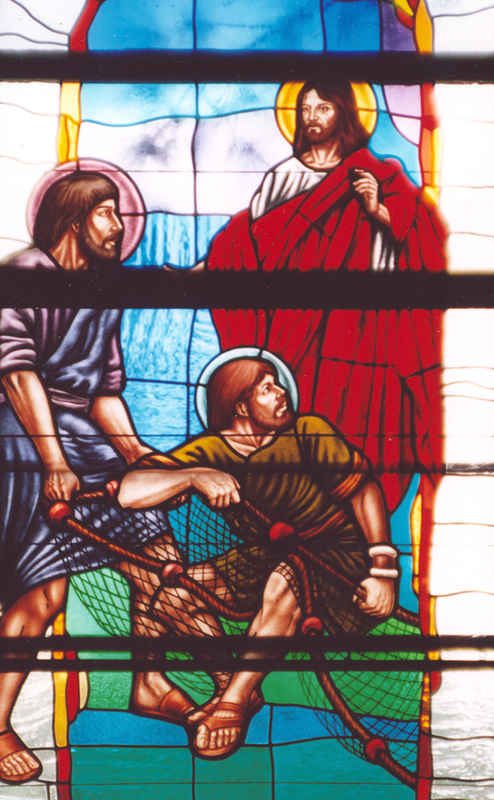 The Fathers of the Church agree that Peter's boat symbolizes the Church; the net signifies the unity of the church which is not broken; the sea symbolizes the world; and the fish symbolize those who become believers of the Lord. Then we are presented with an interesting exchange between the Lord and St. Peter. Three times Jesus asks Peter if he loves Him and by the third time, Peter is hurt that our Lord may not be too convinced of his claims of loving the Lord. The Fathers of the Church tells us that Jesus asks Peter the same question three times as a remedy for Peter's three denials of our Lord on Holy Thursday evening. In mercy, Jesus gives Peter a chance to redeem himself after Peter's catastrophic denials. After each of Peter's responses, Jesus gives Peter a mandate to feed and tend the flock of believers. As the first Pope, Peter would establish the Church in Rome and feed the Lord's flock with the sacraments and govern them as their chief shepherd. This has been the charge of every one of Peter's 264 successors all the way down to John Paul II. This is why the Church of Rome maintains a pride of place in the universal Church. Not only was it St. Peter's diocese, but it was also where Peter would lay down his life in martyrdom as Jesus predicts in today's Gospel. Outside of Rome's ancient walls is the Church of Quo Vadis, which has stood there since antiquity. It was on this site that Peter met our Lord in a vision as Peter was fleeing Rome at the height of the Emperor Nero's persecution of the Christians in about 64 AD. Pious tradition tells us that Peter was walking down the Apian Way, escaping out of the city when he crossed paths with our Lord, who was walking towards Rome. Peter asked Jesus, "Quo vadis, Domine?" or "Where are you going, Lord?" Jesus answered, "I am going to Rome to be crucified again." Peter knew then and there that the time for him to glorify God in martyrdom had finally come. No longer could he run, as he did on Holy Thursday night so many years ago. We know the rest of the story - Peter returns to Rome to be with his flock, is arrested and is crucified upside down because he did not deem himself worthy to die like his master. Incidentally, Peter is crucified on a hill named Vaticanus - the very site of the present-day Vatican. What drove Peter to turn around to die a martyr's death? Something Peter saw must have convinced him that martyrdom meant a sure path to heaven. Well, it was not something that Peter saw, but SOMEONE. Peter saw and touched and conversed with the Resurrected Lord. He knew that the same glory awaited him so long as He remained faithful to the Gospel and his vocation. The presence of Peter's relics under the high altar of St. Peter's Basilica in Rome is, in a way, proof that the Resurrection really happened - that the fact of Resurrection, as the central mystery of our faith, is worthy not only of belief but worthy of giving one's life for. In our first reading, we learn how Peter and the apostles rejoiced that they had been found worthy to suffer dishonor for the sake of the name of the Lord Jesus. Emboldened by the power of the Holy Spirit at Pentecost, they were firm in their conviction that it was better for them to obey God rather than men. We should adopt this conviction as a personal maxim - to obey God rather than men. If we really try to live our Catholic faith, then we know that suffering for the sake of the name will come our way. Some of the great saints warn us that if you are too comfortable in your Catholic faith, then you may not really be living it. The Faith causes discomfort in the world because it is not of the world, even though it expresses itself in the world. So, we ask, "Do we rejoice in this suffering or do we fret and fear what it may cost us? Is the cost sometimes too much when we must obey God rather than men?" I am so edified as a priest to see this challenge lived out among our fellow parishioners in everyday life. There's the parent whose child is a Catholic but who refuses to either get married in the Church or obtain the necessary dispensation to marry outside the Catholic Church, thus rendering their attempted marriage invalid. Rather than succumb to a love for human respect, the parent makes the courageous decision to not attend the wedding, for fear of committing the sin of scandal by giving assent to an invalid bond. Then, there's the grandparent who takes their grandchild to church each Sunday because the parents of the grandchild remain indifferent to the faith. Or, there's the teenager who has decided to wait until marriage to share the gift of sexuality with their spouse even though they're the object of ridicule among their peers. Then there's the priest who calmly and compassionately explains that we cannot extend Holy Communion to non-Catholics, not because of a lack of hospitality, but because it would force non-Catholics to say "Amen" to a reality (the Eucharist) they don't accept and express a unity of belief that simply doesn't exist. Obeying God rather than men is not always easy. The costs can be very high, but how pleased the Lord truly is when we honor the commandment to love Him with our whole heart, mind, body and soul - always, not just when it's convenient or easy or non-controversial. The temptation to succumb to human respect is so strong. Like Peter, we do well to pray to have the right answer when our Lord asks us, "Do you love me?" Like Peter, may we answer - "Lord, you know everything; you know that I love you!" May our actions and the witness of our lives always remain consistent with this conviction and may we live the assurance that the Lord is ever near to those who follow Him - to those who delight and walk in His ways.